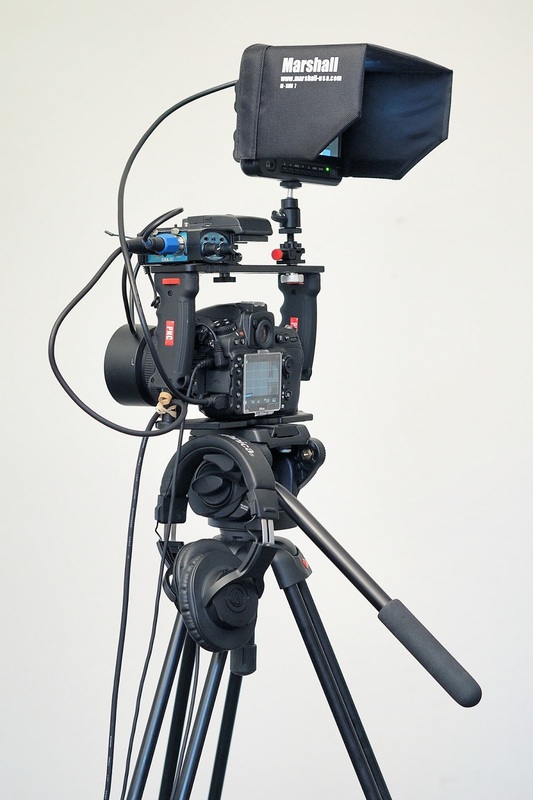 A Reader Asked to See How I Was Rigging My Video Gear Around the Camera. Here's My Set-up. This is the set up I used to shoot the video I talked about in the previous blog post. The box on the top left is the Beachtek DXA-2T which is a passive microphone mixer. I can combine both channels into one or keep the signals in separate channels. The important thing is that the Beachtek box allows me to control audio levels as needed. Always going down, never up; because there are no active preamplifiers in the box. 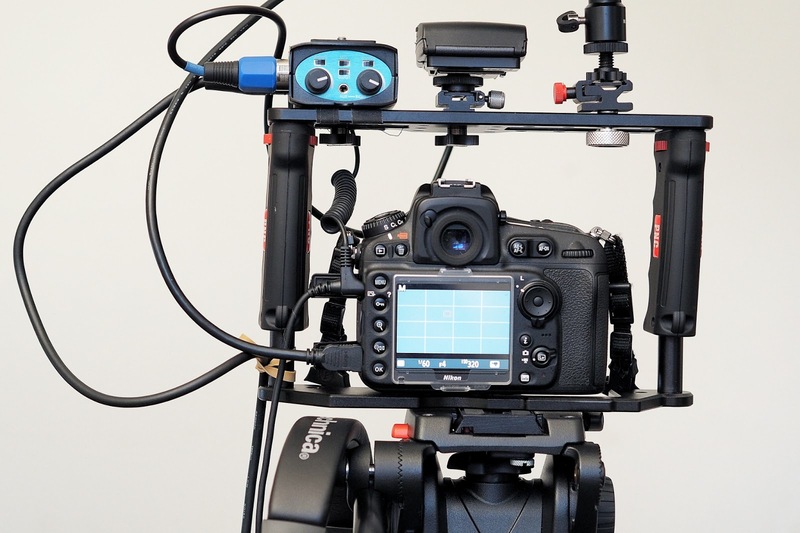 But it also does a great job of impedance matching between the professional XLR connected microphones and the consumer level, mini-plug inputs. Next to the blue Beachtek box is a Sennheiser receiver which is one half of the wireless microphone support set. Note that its output is connected into the mixer. I can add more utility shoes to the top bar of this "cage" in order to add more stuff but at a certain point more stuff makes the whole rig top heavy, plus it's already starting to look messy.... Don't try this with a little weanie tripod and head! The Marshall monitor is a cheap one but it does a nice job. People can watch what I'm shooting without breathing down my neck and I can click on the focus peaking and see if what I'm shooting is really in focus or not. The headphones serve the same purpose only for ears. I will need to add a little hook to one of the tripod legs to hand the headphones on when we're between takes. If I'm going to use a tripod it's really nice to have all the stuff I need right there, clustered around the camera. These are all simple and effective tools but they make a difference in the shooting. 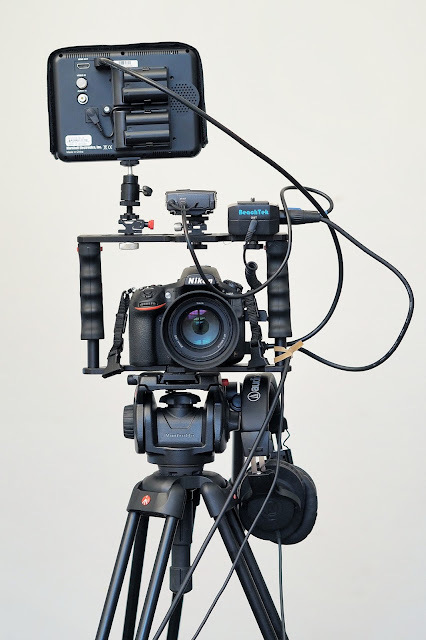 You can imagine that on bigger sets with multiple monitors and digital recorders sucking information out of the camera's HDMI socket and with the camera rigged with a follow focus mechanism and a matte box things get complex, crowded and more and more unwieldy. When I shoot with the Olympus stuff I don't want to wire it up like so. I want to shoot with them handheld and use the EVF finder. The D810 doesn't seem to mind the add-ons. 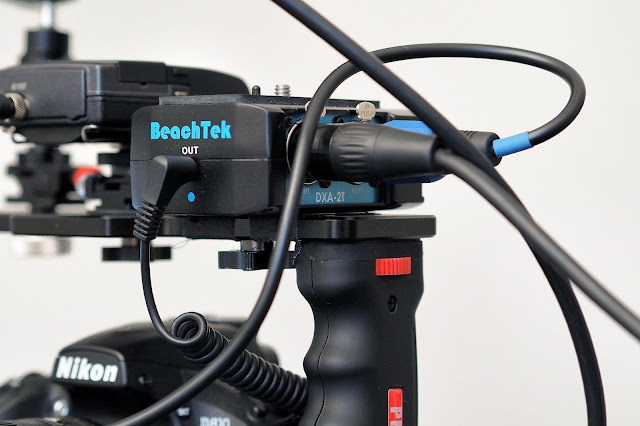 Cost of stuff: The Beachtek box is about $170, the Sennheiser system, with lavaliere microphone is $700, The monitor is $349 and the grippy/cagey thing was a little less than $100. Not bad at all for stuff you can really use to make video projects work. The Giddy Excitement of Getting Something Just Right. A video project for the theater. A screen grab from my video project at Zach Theatre. I have a really, really fun job and it amazes me that I can still get excited about things like getting the lighting on a subject just right, or getting the audio perfect. You would think after almost thirty years in the business that one would get a bit jaded. A bit complacent. In a short length of time yesterday, in the early evening, I had the wonderful feeling that I lined up everything correctly. Please let me share. Zach Theatre is doing a play called, Mothers and Sons, and they cast Michael Learned in one of the starring roles. For those of you who don't know Ms. Learned she is the actress who played Olivia Walton (the Walton's mom) in the Waltons. She has been in numerous movies, is very active on the stage and has won four Emmy's for Best Actress. You've often heard people talk about someone who lights up a room by just walking in? That would be Ms. Learned. The production team at Zach wanted to do a thirty second TV spot featuring Ms. Learned against black, in character, for the upcoming play. The team got in touch and asked me to do the project. I immediately went into pre-production mode and got as many details as I could. We would be shooting the principal part of the spot with Ms. Learned against a black background. 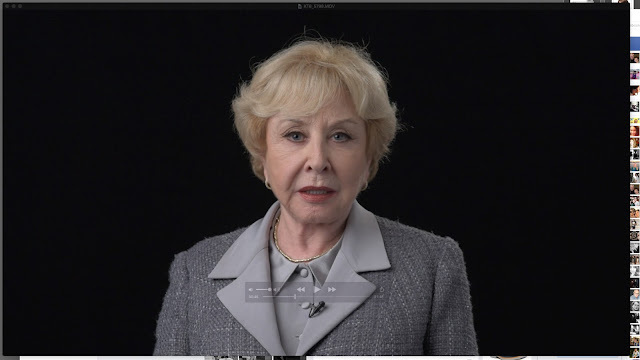 She would be speaking directly into camera and the audio was critical. They wanted the lighting to be natural and non-clinical. I would need to be totally set and tested by the time Ms. Learned appeared on our set as we would only have a limited amount of time to get what we needed before she had to get to another commitment. The first thing I needed to lock down was a black background. I checked pricing for a roll of black seamless background paper, nine feet wide. It would be $55. I checked on getting a black muslin in a 10 by12 foot size and at Amazon it was $29. Since I pay for the Prime service shipping to my studio door was free. I went with the muslin option and it was delivered in the pouring rain on Friday; just in time. I experimented with lighting and devised a different way of lighting this video than I had used before. I also went back in time and selected one lighting instrument from antiquity that acquitted itself very well. I wanted a soft light that was directional so I used a 72 inch, soft white (with black backing) Fotodiox umbrella as my main light, just to the left of the camera. I lit up the umbrella with an old (very old) Lowell Tota-Light that a friend had given me years ago. When the whole combination was used as close as I wanted it to my subject to get the right balance of softness and detail I got the exposure I was looking for into the bargain. A 750 watt tungsten light is still (relatively speaking) a powerful source. Just to my subject's left (right hand side of the frame) I put up a very big white reflector. It's just out of camera range but it tamed the lighting ratio and added additional softness and fill to the overall image. The final piece of lighting was the chameleon in my case; the Fiilex P360 LED light. I dialed the color temperature dial all the way to tungsten (to match the main light) and used it high up and about twenty feet behind the subject, on her left side. The Fiilex makes a great backlight and is one of the few, very high quality LED products that can be used as a spot. In order to assess the effects of the lighting set up as we worked, my producer, Michael Ferstenfeld, acted as the stand in and was very patient as I moved lights around and finessed the subject to camera to background distances. 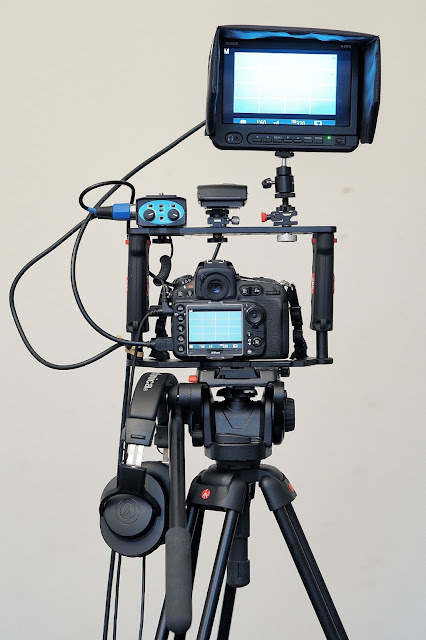 I used the Nikon D810 as my video camera setting the camera to its highest quality setting and, after consultation with my editor, set the rig to 29.97 fps. The exposure was 1/60th of a second with my 85mm f1.8 G Nikon lens set at f4.0. The ISO was 320. Since the entire set was illuminated by tungsten halogen bulbs (of the equivalent) I was able to use the tungsten preset for WB. I had the D810 hooked up to my 7 inch Marshall monitor, via HDMI, to provide focus peaking during set up and shooting and to provide a big monitor for the artistic director and the producer to watch as I filmed. The bigger screen, in combination with focus peaking made it easy to manually focus the 85mm and I paid close attention to both the screen and the subject's relationship to her mark on the floor while I was shooting. The final step was to get the audio set up and zero'd in. I wanted to use two microphones on this set up, just to cover myself. The primary unit was a Sennheiser wireless rig and you can see the mic placement on the subject in the screen grab above. This is a great wireless mic set up and one we use all the time but every once in a while an actor will get carried away and get loud enough to blast out of the safe levels and distort the audio. I wanted a second "safety" channel with a different mic set about 12 db down from the main microphone; just in case. As a back-up I chose the Rode NTG-2 shotgun microphone. I wired it up with an XLR cable and put it on a Gitzo microphone boom and secured that to a stout light stand. The microphone is about 18 inches above and in front of Ms. Learned. Both microphones were running through a small, passive mixer and into the camera's audio input. I use the mixer because it gives me physical knobs to twist for each channel. After we do several rehearsal takes with our actor I can quickly set the levels that work best without having to menu dive or get finger-traction on a small, rear screen. The difference between the channels ended up being about 6db as I dialed down the input from the main microphone by a bit during rehearsal. I always wear headphones when shooting speaking parts in video so I can hear anything that make make the recorded sound unusable. Ms. Learned came in trailed by the costumer and the theater's make-up person. She instantly memorized her lines and walked over to the mark. We shot six or seven takes but honestly, she nailed it on the very first take, everything else was just in case. Her whole time investment on set was a bit less than 15 minutes. We all reviewed the product, couldn't figure out a single way to improve it and so we wrapped up and started packing. I played the segments on my computer for the first time this morning and got that warm and happy feeling of having nailed something as well as I possibly could. Another step forward.